Paleo Salted Choc Caramel Slice | The BEST paleo dessert! 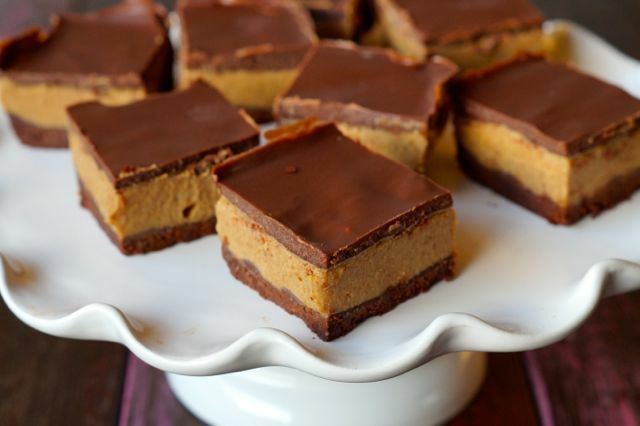 Paleo Salted Choc Caramel Slice Recipe. Are you drooling yet? Are you hooked? Or should we type it again? 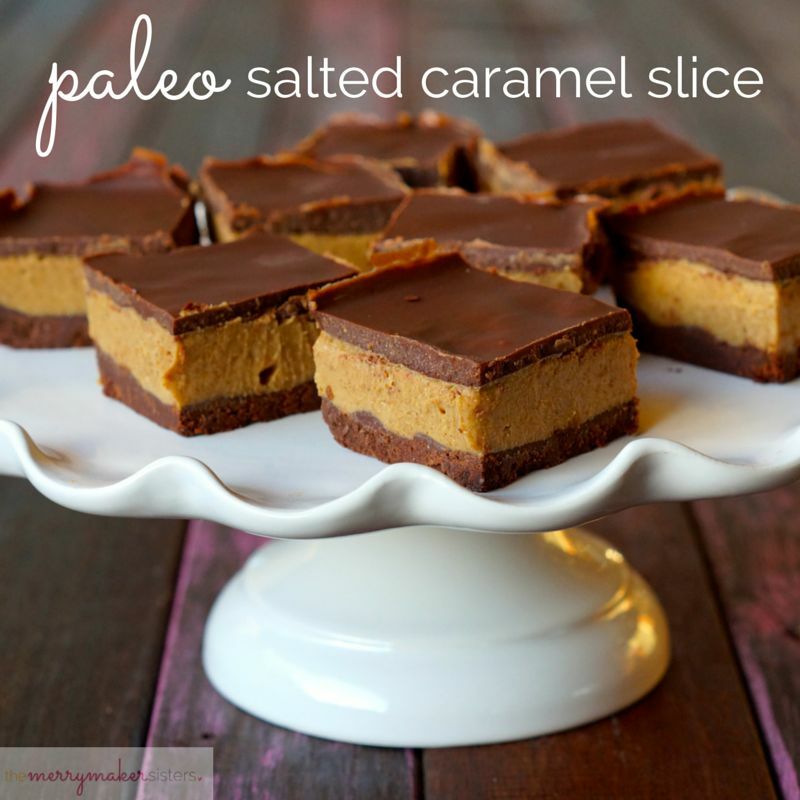 Yes, we said Paleo Salted Choc Caramel Slice! We should really just go straight into the recipe but we need to mention how completely delicious this slice is. Like it’s seriously 100% completely drool worthy, we’re talking #getinmybelly goodness! It’s SO good that we put the recipe is our hardcopy book: MAKE IT MERRY! If you love this recipe, then you might love the book! Check it out here! This slice is a three layer salty, caramelly, chocolatey dessert and it’s going to rock your world! Before you all go and make this epic paleo sweet treat (THE paleo sweet treat to beat all other paleo sweet treats) we want to thank the amazing Daniel aka The Aussie Paleo Chef. We were inspired by his caramel slice recipe and created our own merrymaker version! His food is all kinds of delicious, we are so lucky that he is bringing ‘Elemental’, Canberra’s first paleo restaurant to life! Opening mid February 2015! We will be dining here VERY often! PS. if you’re looking for a LOW FRUCTOSE salted caramel slice recipe… click here! Line a 20 x 10 cm (8 x 4 inch) loaf tin with baking paper. Place all the base ingredients in to a food processor (we use our Vitamix). Whiz until well combined, it will be a little sticky and crumbly. Press this mix in to the prepared tin, ensure it is pressed evenly. Place the tin in to the freezer. Using the food processor (don't worry about washing it) place all the caramel filling ingredients and whiz until completely smooth (it will take around 5 minutes). Pour this delicious mixture over the top of the base and return to the freezer. Using the food processor (again, don't worry about washing it) add the raw cacao, coconut oil and maple syrup, whiz until completely smooth. Pour the choc topping over the caramel filling, shake the tin slightly to even it out. Sprinkle with Himalayan pink salt if you like things extra salty. Return to the freezer for about 1 hour or until completely set. Once set, cut into slices and eat it all up! Ok maybe not all at once! This is a sweet treat! It's a TREAT! Very high in natural sugars! Not an everyday menu item. Our hot tip is to keep it in the freezer and only slice very small portions and let defrost when you want to eat. This will help you to not eat the whole slice (hehe)!